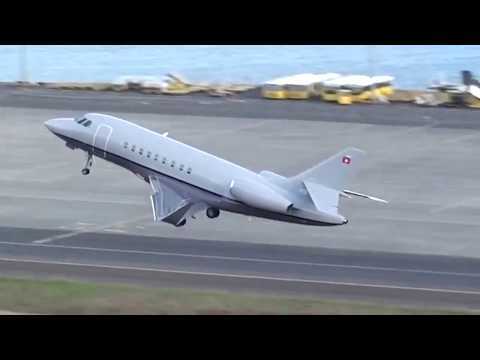 Dassault launched the Falcon 2000LXS in 2014 as the latest edition of the vastly successful Falcon 2000 range. This Large Jet combines the ultra high performance of its predecessor, the 2000LX, with the impressive low-speed operations of the 2000S, giving it excellent short runway capabilities. Consequently, not only does the 2000LXS offer best-in-class fuel efficiency and exceptional range, easily connecting Paris and New York or Dubai and London, but it is also able to access many more airfields than other aircraft in its category, often getting you closer to your final destination. This state-of-the-art business jet is also fitted with the latest entertainment systems and features an incredibly quiet, spacious and modern cabin, which caters for up to 10 passengers. The Falcon 2000LXS brings together intelligent design, class-leading performance and optimized comfort to make it an ideal aircraft for luxury transatlantic travel.